The latest iteration of the legendary Cinénova Grande amplifier is a true tale of evolution. Since its inception the Cinenova Grande reference platform has been the benchmark for new technology. New innovations are constantly put up against the reference design. Astonishingly few circuitry innovations become the genesis of true audio evolution. It is our sincere belief that the new generation represents a meaningful improvement. During the research process for the Cinenova 7, the Grandes smaller sibling, three core technologies were developed. All designed to optimize the amplifiers performance and sound quality. These new technologies proved so successful that with them the Cinénova Grande reference design itself has been reborn. 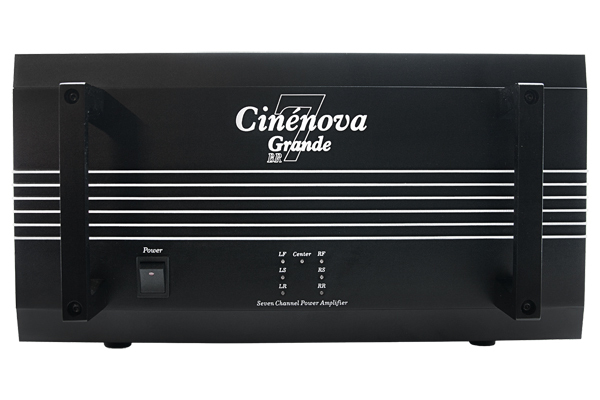 The Cinénova Grande has long been the most powerful multi channel amplifier on the market. The new channel-bridge feature further propels the Cinénova Grande into the wattage stratosphere. Breaking the vaunted 1,500 watts at 8 ohm HIFI amplifier barrier. A feat previously accomplished by only a handful of exotic 2 channel high-end amplifiers. Like its predecessors the Grande BR is a tempered blend of traditional high-end virtues combined with innovative and novel circuitry design. Produced using in-house proprietary manufacturing techniques. Operating in an enhanced class AB state gives it industry leading efficiency making the Cinénova Grande BR a true green amplifier. A brief introduction to the three core technologies new to the Cinenova Grande. The ION technology (In-Circuit Optimization Network) is an advanced network of connection points on the Cinénova Grande BR circuit-boards. Traditionally, transistors and capacitors are paired, grouped and tested to ensure compatibility. However, it has been shown especially by exotic and esoteric audiophiles across the globe that even highly refined mass produced amplifiers have substantial room for improvement when individually tweaked and optimized. A lot happens when individual components are put together in a circuit. A certain margin of difference between two seemingly identical circuits exists. Some engineers refer to this as the “Ghost in the machine.” The option of being able to fine-tune and optimize a circuit even after it has been built would be the evolutionary solution - enter the ION technology. ION enables individual tweaking while remaining in a mass production environment. Power supply efficiency, stiffness and strength are dependent on several factors. The ConCurrent design is the culmination of intense optimization of all known parameters. To stiffen the supply (lower regulation factor) the transformer cores are made of ferrite instead of a lower grade iron material. The windings are made with the same oxygen free copper that is used in high-end speaker cables. To ensure hum-free operation, the transformer is hard-wound and made with military grade high temperature lacquer. The ConCurrent power supply in the Cinénova Grande BR has a transformer rating of 4000VA. From the loudest crescendo to the finest syllable, the Cinénova Grande BR will remain composed and in control. We invite you to enjoy the unique ownership experience of this Cinénova amplifier that was designed by a brilliant mind and built with loving hands. 4000VA ferrite OFC low regulation transformer with separate secondary windings. Cinénova Grande BR exceed effortlessly technical standards set by THX, DTS and Dolby Laboratories. Channel Separation: at least 120 dB. Max. Input voltage: 1.9 volts. 12v trigger ( can be switched automatically from your preamplifier or other components with 12v trigger output). Built-in Crossover: selectable between high-pass and low-pass or disengaged. 20Hz - 5kHz infinitely variable. The crossover allows you to determine how much bandwidth your speakers to reproduce. Use the amplifier to bi-amping two channels can be made to reproduce bass / midrange frequencies and two channels for the treble and the last channel might. drive a large passive subwoofer. All this without using any crossovers. Oversized, gold plated 7-way output terminals. Weight: 61,5 kg. Carrying handle on the front panel. Proper lifting technique is recommended. The transformer has a built-in thermal protection. FFI (Fused Fault Indicators). Diode indicators on the amplifier rear indicates whether a parameter has been exceeded. Each module block is thermally protected. The amplifier is protected against forwarding bad DC to the speaker. The amplifier is protected against short circuit, transistor burning and internal errors. The amplifier is equipped with a 25 amp main fuse (supports your electrical installation larger effect, fuse switch to a major). Each module block is equipped with a 15 amp main fuse pop. Each module block is equipped with two. 10 amp fuses. One for + and one for -. Two diodes back of each modular block monitors whether a fuse is blown. Power transient (prevents the amplifier from making loud noise in the loudspeaker at boot). EZXS technology means that each module block individual can be taken out of service. Should it ever need service. Cinénova Grande is hand built in the USA and undergoes a 24-hour test and burn-in process before it is measured and approved for sale. 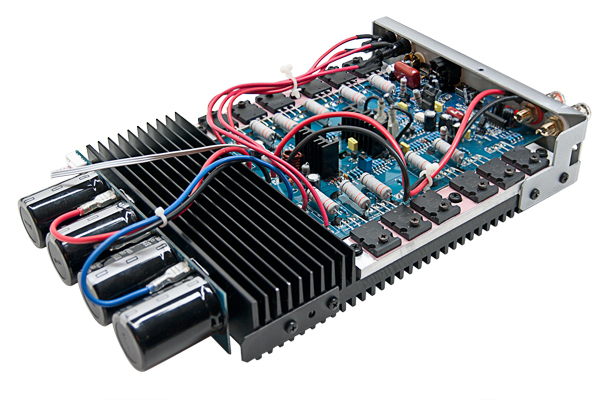 Each amplifier is supplied with its own individual data sheet, where the amplifier's exact measurements are applied, and the name of the technician who performed the measurements. This is proof of performance and ensures that the amplifier lives up to our promise of guaranteed excellence.